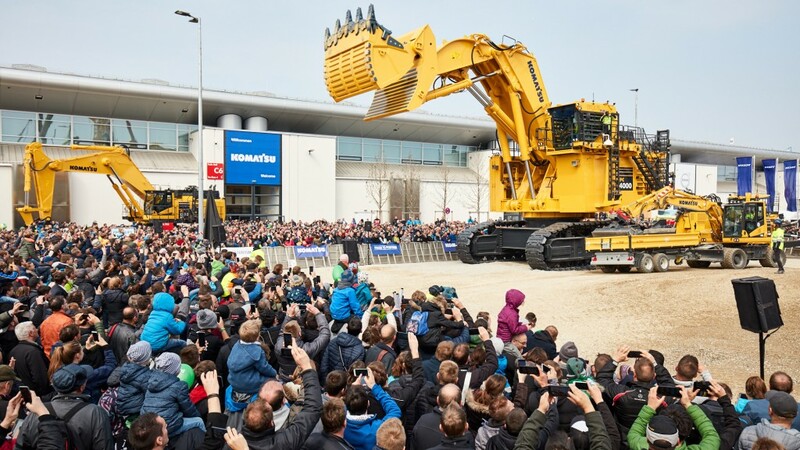 Around 3,700 exhibitors from 63 countries attended bauma 2019. With its unprecedented 614,000 square meters of space, the largest bauma ever held was once again a bauma filled with records. During the 2019 edition, exhibitors unveiled a huge number of innovations and new products to the trade fair's global visitors. Zeppelin/Caterpillar, for instance, introduced more than 20 world premieres. Business conducted at the exhibition was correspondingly good. Many exhibitors spoke of a high willingness to invest. The record-setting bauma also had a strong impact on order books as exhibitors generated the highest sales in the history of their participation at the trade fair. variety, ingenuity and performance can be demonstrated to an immense international business audience." Zimmerman Smith of Serious Labs said bauma created "exciting opportunities that we didn't even know existed." What's more, bauma was "simply a whole lot of fun," she said. Once again, bauma proved itself to be an excellent business platform, many exhibitors noted. Andreas Böhm, a member of the Board of Directors of Liebherr International AG, said: "We took orders from all parts of the world and made a whole lot of new contacts." PERI is also "taking many excellent orders home with it," said Alexander Schwörer, Managing Director for Marketing and Sales. Zeppelin Baumaschinen also "closed a lot of business deals," said Fred Cordes, Chairman of the Management Board. Joachim Schmid, Managing Director of the Construction Machinery and Building Material Association of the German Engineering Federation, said he learned one thing in his conversations with exhibitors: "Many trade fair exhibitors had a specific interest in buying when they dropped by company booths, something that fuels hopes for continuing economic stability." bauma 2019 was impressive not just because of the internationality of the visitors who journeyed from all parts of the world to Munich. "The quality and quantity of decision makers from our target groups were exceptional," Martin Herrenknecht said. Gernot Hein, Director of Communications and Public Affairs at ZF Friedrichshafen, said: "The number and quality of professional conversations were very high." And Riccardo Magni, the President of Magni Telescopic Handlers, had an explanation for the trade fair's tremendous performance: "The experienced and professional visitors and the careful organization were the foundation of bauma's success." The clear focal point of this year's bauma was sustainable and digital solutions. All exhibitors agreed that digitalization is a "megatrend" in the construction machinery industry, said Andreas Klauser, the CEO of PALFINGER AG. Sensors and communication interfaces that collect and analyze data have become standard equipment. Overall, machines and vehicles are becoming cleaner, quieter and more efficient. Many now have electric and hybrid drive systems. "Customers' interest in electric drive systems has never been so high as it was this year," said Dr. Frank Hiller, Chairman of the Board of Management at DEUTZ AG. "It was a dominant issue at bauma 2019." Some of the most interesting innovations were honored with the bauma Innovation Award on the evening before the trade fair opened. Visits by many high-ranking political leaders underscored bauma's exceptional importance, a reputation that extends far beyond the industry itself. "This trade fair is a showcase for Germany," Peter Altmaier, the German Minister for Economic Affairs and Energy, said at the opening of bauma. The Bavarian Minister President, Dr. Markus Söder, said, "For me as a private individual, a visit to bauma has always been a highlight in my life." Hubert Aiwanger, Bavarian State Minister for Economic Affairs, State Development and Energy, Deputy Minister President, also took an extended tour of the trade fair. bauma's partner country, Canada, was represented in part by Stéphane Dion, the Ambassador and former Minister of Foreign Affairs, and Jonatan Julien, the Minister of Energy and Natural Resources of the Bavarian partner province Quebec. The Chinese delegation was led by Wang Bingnan, Vice Minister of Commerce of the People's Republic of China. bauma's visitors added a strong new accent to Munich during the seven-day trade fair. There were people from all parts of the world everywhere you looked - this was the defining feature of the fairgrounds in Riem, both in the halls and on the outdoor exhibition area. Visitors massed at the trade fair's hot spots, the impressive vehicle and machine displays set up by major exhibitors. In addition to its industrial focus, bauma was also a huge world of experience and adventure with a selfie tower and Ferris wheel. Jorge Cuartero, Managing Director of the Spanish manufacturer association Anmopyc, summed things up this way: for a full week, bauma was "the place to be."